Last week a DNR forester and I were walking around the farm looking at the trees for a possible harvest and we ran across a hole in the snow. We determined it to be Red Fox den. 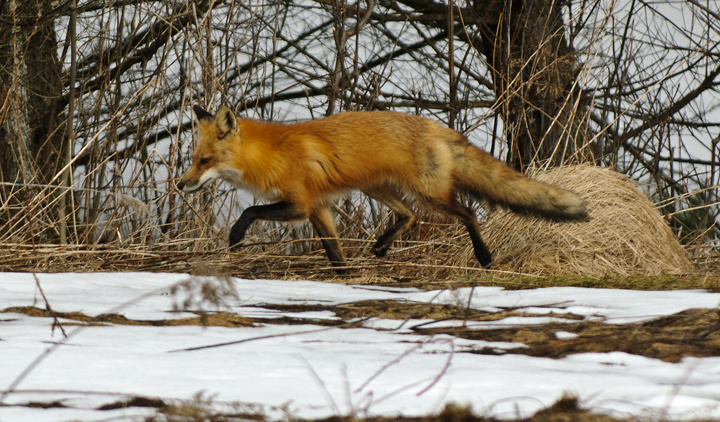 I haven’t seen any Red Foxes around the farm in a number of years. I had one turn up at my bird feeder about four years ago and about 25 years ago there were a fox and some kits that we watched out in one of the fields. The next morning I happened to look out the window and saw the fox around the den. It looked like it caught something and then walked all the way across the back yard into the woods. This was just after sunrise. I tried to get the camera out but wasn’t fast enough to get a shot. The next morning about 10am I looked out the back window and saw the fox again this time making the return trip toward the den. I was able to get a few shots with the camera. This is a shot of it near the den taken out of my window. We are hoping to see some kits in the spring.